106 • RV PRO • March 2019 rv-pro.com Distributor Show Coverage A F T E R M A R K E T Fred Petrivelli, vice president of sales for the U.S., noted that the company has 37 outside sales team members and that sales team members are located in six RV call centers. The outside sales team assists suppliers in a variety of ways, including new VIA feature training, Magnifinder updates, in-store inventory management focused on turns, new product placement and training, outgoing product training and ride- alongs with suppliers, Petrivelli said. Additionally, he noted that the SMART Merchandising Team does about 30 new store sets a year, allowing dealers to freshen up their parts departments. Larry Montante, NTP-STAG vice president of category man- agement, said that the distributor has undertaken a number of initiatives focused on new products, new customers, increased customer penetration and digital solutions that offer benefits for the distributor, suppliers and its customers. These include a full complement of B2B digital solutions to help customers grow and social media penetration designed to drive branding for NTP-STAG and its dealers. A Successful Show NTP-STAG officials described its 2019 Expo as one for the record books, as sales, exhibit hall size and attendance all appeared to break previous show records. "We had high expectations going into this event," Rogers said. "The results were exactly what we hoped for – strong attendance, a busy show floor, solid representation by leading suppliers in our market and great sales." More than 3,000 people attended this year's two-day Expo, the vast majority of them RV dealership personnel from across North America. The event's 150,000-square-foot exhibit hall featured more than 200 suppliers, including 17 that were new to this year's event. 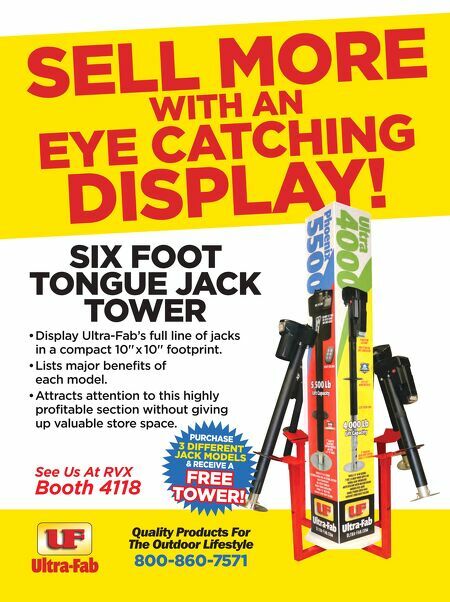 For their part, exhibitors interviewed by RV PRO said they were pleased with dealer traffic and attendees were in a buying mood (see related story on page 104). Meanwhile, the Expo's RV University had its largest attendance ever, with more than 1,100 dealership personnel attending product-focused educational classes by 30-plus sup- pliers plus Professional Retail Organization (PRO) business development seminars. "Our training and education programs continue to be a strong draw for the Expo," said Spaulding. "It reinforces the fact that there is a desire for people to be better at their jobs and have a deeper understanding of the products, business practices and trends that impact their success. Having over 1,100 people signed up to participate in our educational programs this year was incredible." Of course, the Expo has a strong sales component to it. By offering "Power Hour" discount pricing on select products com- bined with highlighting products that can be merchandised to improve impulse shopping and overall store sales performance, NTP-STAG was able to give dealers tools to improve their parts department operations, according to Petrivelli, NTP-STAG's vice president of sales for the U.S. "Helping customers find new products and showing them how to sell them was a key initiative for us at the show this year," he said. "Based upon the level of interest we saw in the merchandising area, and with 17 new suppliers we had on the show floor, I would say we delivered on that one." Summing up this year's Expo experience, Rogers said, "I'd have to say that things are off to a pretty good start. The suppliers were very complimentary. Our customers were appreciative and upbeat, and they really showed a keen interest in a lot of the new things we introduced. From our Marketing Garage digital content solutions and Parts VIA to product and service offers from DISH, Pet Comfort, Blue Ox, Airxcel, Carefree, Valterra and others, I really couldn't be happier with what I saw this week. The best part was being able to build on so many great relationships that we have." 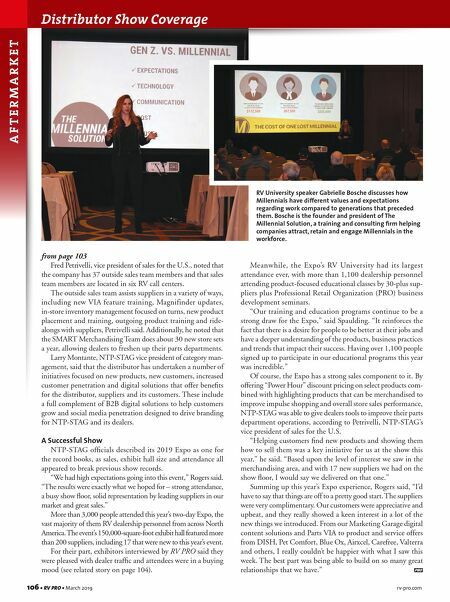 from page 103 RV University speaker Gabrielle Bosche discusses how Millennials have different values and expectations regarding work compared to generations that preceded them. Bosche is the founder and president of The Millennial Solution, a training and consulting firm helping companies attract, retain and engage Millennials in the workforce.